One could be forgiven for assuming that humbuckers and mini-humbuckers are the same but for their physical size. In fact, this is a common misconception among guitarists, owing at least in part to the term "mini-humbucker," which itself suggests that size is the single defining aspect of this pickup's personality. This obscures the truth of the matter, however, which is best learned with one's ears. Without question, the best real-world demonstration of the distinct sonic differences between humbuckers and mini-humbuckers is the legendary 1978 Thin Lizzy live document, Live and Dangerous. This rock-n-roll classic captures Phil Lynott and company at the height of their powers, while incidentally serving as a perfect reference for comparing the tone of a PAF-equipped Gibson Les Paul Standard with the tone of its mini-equipped younger sibling, the Les Paul Deluxe. Drop the needle on the album's first track, "Jailbreak," and you will hear Thin Lizzy guitarists Scott Gorham (panned right in the mix) and Brian Robertson (panned left) tearing through the song's monstrous opening riff. It is immediately clear that Gorham's LP Deluxe sounds noticeably brighter overall than Robertson's Standard, which exhibits the heavy, muscular grunt we commonly associate with a Les Paul through a cranked Marshall. In stark contrast, Gorham's sound is almost single-coil like, with less bass content and rich, highly saturated treble and mid-range frequencies. Together these contrasting tones create one of the most compelling and dynamic dual-guitar attacks in hard rock history. Why Does the Mini-Humbucker Sound Different? So what accounts for this difference in tone? Well, as it turns out, size really is important when it comes to magnetic pickups. The mini-humbucker has almost everything in common with its iconic Seth Lover-designed counterpart, the PAF, except for size. Because of its smaller physical area though, there are major implications for tone: The mini picks up a shorter length of the vibrating guitar string, which directly correlates to less overall low-end content, slightly lower output, and a clearer tone with an abundance of high-end sparkle. The mini also has lower iron content in its core (due to its size), which further contributes to these characteristics. Fans of this somewhat underutilized transducer love it for its clarity and jangle, as well as its tendency to retain string definition even under the heaviest distortion. A good mini will also grind and sing like nobody's business when pushed hard. As previously mentioned, the basic construction of a mini-humbucker is essentially the same as a regular humbucker, only miniaturized. 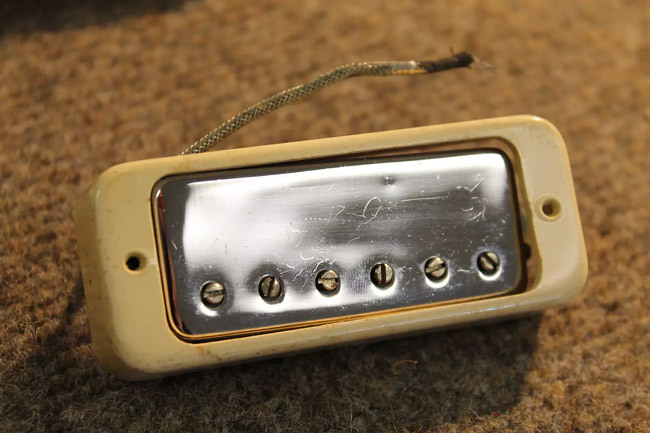 Each coil has a bar magnet underneath of it, with the familiar adjustable pole pieces that most of us would recognize from a PAF-style pickup, each made of a magnetic, iron-based alloy (the technical term for this kind of metal alloy is "ferrous"). The other coil in the pickup also contains a similar ferrous bar magnet, but without the adjustable pole pieces. The only difference in a standard PAF-style design is that, rather than a second, non-adjustable bar magnet, there are typically several metal slugs arranged in series. Unbeknownst to many, the mini-humbucker design originated with Epiphone, with Gibson acquiring the rights and technology when its parent company, CMI, purchased Epiphone in 1957. The mini-humbucker was the stock pickup of the original Epiphone Sheraton model. 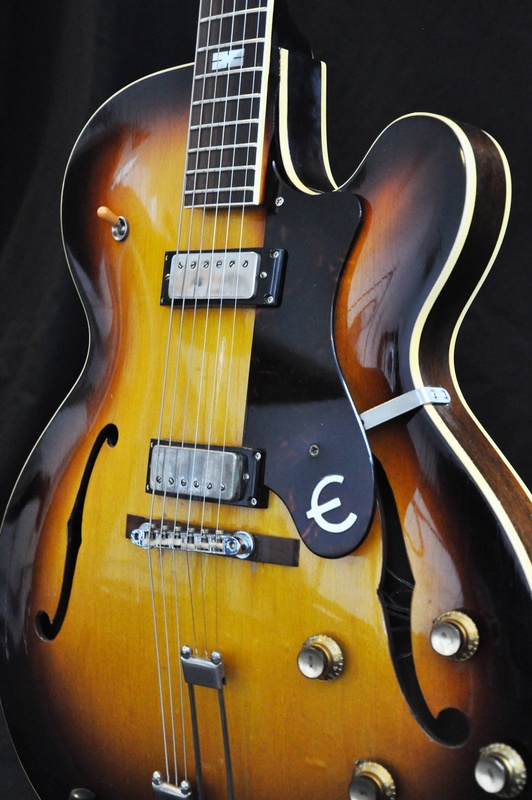 This feature set the Sheraton apart from Gibson's ES-335, which was spec'd with full-size humbuckers, as both guitars were developed concurrently in a joint Gibson/Epiphone project. The mini-humbucker first became widely known to rock guitarists in 1968, when Gibson introduced it as the stock pickup of the new Les Paul Deluxe model. Interestingly, the only reason it was featured in the LP Deluxe was because Gibson had an overabundance of minis left over from Epiphone stock, and needed to find a use for them. The solution was to install them in Les Paul bodies that had originally been routed out for P90s, filling in the resulting gap with a specially made adapter ring. When first introduced, and throughout the original run of the Les Paul Deluxe, the mini-humbucker was considered inferior to Gibson's full-sized humbucker. In fact, Thin Lizzy's Gorham, one of the pickup's most celebrated users, only ended up with a mini-equipped Deluxe because the band did not have the budget to purchase a more expensive PAF-loaded Les Paul Standard. In modern times the mini-humbucker has steadily gained respect, as well as a strong cult following among guitarists with a taste for less common tonal flavors. High-profile players like Gorham and Pete Townshend have cemented its legacy as a legitimate tone tool and an iconic pickup design. (Meanwhile, the different mini-humbuckers found in Firebirds were famously used by the likes of Johnny Winter. And a particularly hot Firebird mini-humbucker holds a revered spot in the bridge position of Neil Young's main Les Paul.) It has also experienced something of a renaissance as part of the boutique pickup boom of the last decade. Celebrated custom winders like Jason Lollar, Lindy Fralin, and Curtis Novak have done much to elevate its profile in recent years, while bigger mainstream builders like Seymour Duncan and Dimarzio also offer several stock models. Budget parts suppliers like Guitarfetish also produce some great low-dough mini-humbucker models in several interesting variations. The legacy of the mini-humbucker is stronger than ever, ensuring that these pickups and the guitars designed around them will be with us for a long time.